Jeffrey Herlings (Red Bull KTM) shrugged off the pain of a plated collarbone to win today’s qualification race at the MXGP of Indonesia – round 12 of the FIM Motocross World Championship – at Pangkal Pinang. The 23-year-old, who broke his collarbone in a practice crash two-and-a-half weeks ago, chased his team-mate and main championship rival Tony Cairoli through the opening turn in the 20-minute plus two lap moto before taking the lead a couple of corners later. From there he checked out and at one point led by over eight seconds before backing it off in the closing stages to conserve energy for tomorrow’s two points-paying races. 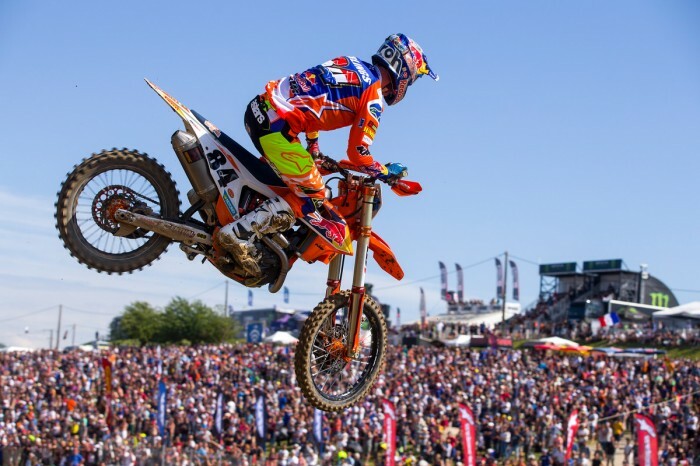 “I’m not fit but that’s normal – I broke my collarbone less than 17 days ago and it was pretty shattered,” said Herlings. “So to come back racing it’s already a blessing and then to win is even more so. After Herlings passed Cairoli the defending champion overshot the turn following the waves section and went off the track which allowed Gautier Paulin (Rockstar Energy Husqvarna), Glenn Coldenhoff (Red Bull KTM), Clement Desalle (Monster Energy Kawasaki) and Tim Gajser (Team HRC) through. Paulin held onto second for five laps and was then gifted some breathing room when Coldenhoff fell but Gajser was on a charge and the 2016 world champion caught and passed the Frenchman just before half-distance. However, the Slovenian appeared to have over-exerted himself in the hot and humid conditions and the following lap he lost places to Paulin, Cairoli and Desalle. Cairoli and Desalle then moved ahead of Paulin as Britain’s Max Anstie (Rockstar Energy Husqvarna) and Romain Febvre (Monster Energy Yamaha) pushed Gajser back to seventh. With three laps to go Anstie tipped over in a turn and lost valuable places as Cairoli chased down Herlings but the Italian couldn’t close the gap and at the flag it was the Dutchman who won by just over three seconds. Desalle was third form Paulin, Febvre, Gajser and Coldenhoff with Anstie best of the Brits in 12th. Shaun Simpson (Wilvo Yamaha) won here last year and the Scot was as high as eighth on the opening lap before he faded back to 16th. With the Hitachi ASA KTM UK team opting not to make the long and expensive journey with Graeme Irwin, the only other British rider in action was Tommy Searle (Bike It DRT Kawasaki) but he went out at half-distance.